Gamer as it appears in Smash. This article is about a stage in Super Smash Bros. for Wii U. For people who play Smash Bros., see smasher. Gamer (ゲーマー, Gamer) is a stage in Super Smash Bros. for Wii U (where it is stylised as GAMER in the PAL version) and Super Smash Bros. Ultimate, based on the Gamer minigame from Game & Wario. In Wii U, Wario is fought here for his unlock battle. The stage is set on 9-Volt's desk. Its main platform is always present, but - like Tortimer Island - the rest of its layout is randomized and changes each time the stage is played. The table always have stickers of 5-Volt, 9-Volt, 18-Volt, and Ana. Additional platforms can contain stickers of Ashley, Spitz and another Ana. If the sketchbook is present on the stage, it will flip pages to show pictures of Mona, Jimmy T., and either Young Cricket (SSB4 only) or Penny (Ultimate only). Occasionally, 9-Volt's mother, 5-Volt, will enter the room and look for fighters. 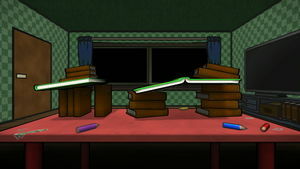 Her line of sight is represented by a beam of light, which fighters can escape by hiding behind furniture (the layout of the furniture changes every match). If 5-Volt spots a fighter, she will get mad and deal 20% damage and high knockback, and paralyzing the fighter. It is blockable, but deals enough shield damage to break a full shield. She can appear in the doorway (occasionally opening it again), window (occasionally smashing it and she will occasionally go back to the window), TV (occasionally jumping out of it and walking around to spot a fighter), or, if the stage is set a certain way, she will appear from a gaming pad or picture from an easel. Fake-outs can also appear. These ten Fake-outs will occur just to scare players and are not harmful. A cat will appear at the door instead of 5-Volt. The door will crack open, but no one will be visible. A man wearing a wig will open the window instead of 5-Volt. 5-Volt will duck out of sight from the window, then come back up weirdly spinning like a top. Note that the suspenseful sound will keep playing until she leaves the window. 5-Volt may simply pass the window after meeting the man. The TV will be static, it can also show a hand making some kind of gesture. The TV will show a "SIGNAL LOST" screen. A cat will appear on the TV and jump out, running around the room. The GamePad will turn to static, but instead of 5-Volt appearing, it will just power off. The suspenseful sound will play, then stops as the easel flips to show a picture other than 5-Volt. In Super Smash Bros. for Wii U, the Ω form only features a desk with no other features that extends below the blast line. 5-Volt will not pop out to attack players, though she'll still appear in the background, and the fake-outs still happen. The TV can still show the stage 5-Volt normally pops out. The door will always be shut. In Super Smash Bros. Ultimate, the Ω form and Battlefield form are similar to SSB4's Ω form; however, the main platform does not extend below the blast line and is resized and reshaped to match Final Destination and Battlefield, respectively and the pencils and the WarioWare character stickers from the original stage still appear with the Ana sticker appear to be moved inward. The three soft platforms of the Battlefield form resemble the green book soft platforms of the regular form with stacks of books in the background supporting them. 5-Volt may enter her "attack" position through the window, but won't actually attack. Additionally, characters can pass through the room's walls. Gamer as it originally appeared in Game & Wario. Gamer is a minigame in Game & Wario. The player would play as 9-Volt trying to play games past his bedtime (in the form of traditional WarioWare microgames on the Wii U GamePad) while his mother, 5-Volt, tries to catch him from different locations such as the windowsill and television. Pressing the ZL and ZR triggers simultaneously makes 9-Volt hide under the covers to avoid her wrath; however, if he spends too much time under the blanket, he will fall asleep, ending the game. If his mother spots him or the player fails the microgames four times, the game ends. The same gamepad used in the minigame may appear in the center portion of the stage. Some layouts can feature elements from other Game & Wario minigames. The right portion of the stage can feature Pyoro and its clay platform which is based off of the minigame Bird. 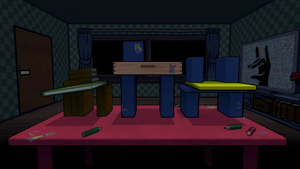 The center stage may feature a building from Stages 1 and 3 in Mona's minigame Shutter along with its occupants. The mode returns in WarioWare Gold under the name Sneaky Gamer with the same premise, albeit on the bottom screen of the Nintendo 3DS instead of the Wii U GamePad. The artwork is all redone to match the character designs in Gold and 9-Volt's Nintendo systems are re-arranged. In both SSB4 and Ultimate, the stage's design resembles the Game & Wario version of the mode, and 5-Volt retains her Game & Wario design. However, the stickers and sketchbook images depicting various WarioWare character art are updated in Ultimate from Game & Wario art to Gold art. Gamer in Super Smash Bros. for Wii U. 5-Volt's silhouette after appearing out of the TV before spotting a player. 5-Volt in a "Devil-ish" expression after spotting a fighter. 5-Volt before spotting a Brawler. 5-Volt's spotting Pikachu and a Brawler while Villager is doing his Down Taunt and surviving 5-Volt. Screenshot of the It's Past Your Bedtime! Event. 5-Volt spotting Ness after appearing out of the easel; note how, due to inaccurate lighting, Mario is not affected. 5-volt after appearing out of the TV screen. 18-Volt sticker that will sometimes randomly appear on the stage. 9-Volt sticker that will sometimes randomly appear on the stage. 5-Volt sticker that will sometimes randomly appear on the stage. In Super Smash Bros. for Wii U, this is the only stage to have an Original Games/Settings tip attached to it. Rarely, a glitch will occur where 5-Volt will get angry at a player for being in her sight, but the player will not be paralyzed. If the sketchbook is present on the stage, players can hide from 5-Volt's gaze in the shadows of the legs of the easel (as seen above), even though she appears from the block of paper placed upon it and, by all accounts, any player standing before the easel should be spotted, as it would be impossible for the easel's legs to block light before them. The visible outer walls of this stage have no collision detection. Meaning that when characters are knocked off, they can be seen going through it. This most likely because of blast zones needing to be on the stage, which compromises the existence of the walls. This page was last edited on April 17, 2019, at 02:32.